When I read the news story about a North Carolina woman faking cancer to save her marriage, I completely understood, as I know someone (not personally, but I'll get to that in a moment) who did the same thing. It makes me wonder how many times this ploy is used across the world that never makes the news. A woman has admitted to having profited from a lie that she had cancer, in a scheme to save her troubled marriage. Amy Ellissa Hammer of Seagrove, North Carolina, was arrested Thursday when a police investigation found that she had pretended to suffer from Chronic Lymphocytic Leukemia, cancer that grows from the bone marrow. Hammer, 30, established a Facebook page called Amy’s Promise to accept donations for alleged healthcare costs. She also sold T-shirts. After Hammer’s arrest, a Mar. 23rd fundraiser at the Trinity Wesleyan Church of Seagrove was canceled. Coffee Talk: A few years ago I worked in the same building as a young woman I became 'work friendly' with enough to chat with if we both happened to be in the same part of the building at the same time, although we weren't really friends. She was a young mother of one child, divorced, and single. She started to have an affair with a married man who also worked in the same building. He was not only married but had a couple small children at the time, including a little newborn. As time went on and more people in the work place knew about their relationship, they got sloppier at hiding it. She also was free with details in talking to many co-workers so word spread quickly. After a few months of being together, she got pregnant with his child. As he was straddling the fence so to speak, he was still with his wife, but still seeing this other woman, his mistress got pregnant; his wife found out about the affair and was devastated. The mistress wanted him to leave his wife and marry her, and worked very, very hard to convince him how happy he would be if he did. She then started to push for them to live together. He and she went ahead and bought a house together in her second trimester, although he was still spending time at his 'house' as well so to not disrupt his children's lives too much. In the meantime his wife was obviously hurting. She was sick with stress and started to get headaches. They got bad enough that she went to the doctor to see about pain relief for them. And that is when her plan was hatched. When she went to the doctor, her husband wanted to know what the doctor said. He showed an interest in her and was worried about her. She started to tell him little lies about more doctor's appointments. That led to her 'headaches' needing to be investigated further. Tests and scans... which he grew increasingly more concerned for her. He spent a little more time at home instead of the girlfriends house, helped with the kids and showed compassion and attention to his wife. As the girlfriends due date got closer, her headaches turned into an announcement of cancer. The wife had fake doctor's appointments and scans and started to supposedly go through treatments... all faked because she was trying desperately to win her husband back. Soon the girlfriends baby was born. But... the wife that faked brain cancer to save her marriage? It actually worked. At least it did at the time - I live thousands of miles away from that area now so I don't know whatever came of that story. 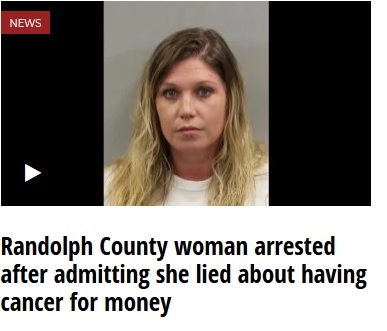 It never made the local news... but yes, I knew of a woman who also faked cancer to save her marriage.